A minimalistic silhouette with a hint of height, Valencia is sure to become a favourite for all occasions. 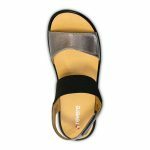 These women’s wedge sandals feature an elastic strap across the vamp which adds comfort and flexibility, while providing a textural contrast to the shoe’s supple leather or snake. These are the perfect orthopedic shoes for women looking for a sleek, yet bold look.